Puma BMW Williams Track Jacket - Ladies Cut. 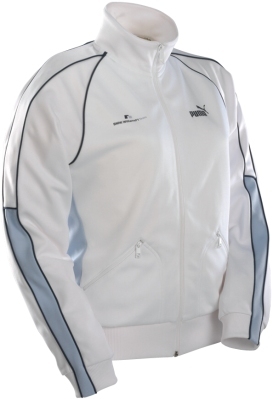 White track jacket with dark blue piping and raglan sleeves with light blue insets on the sides and underarms. BMW Williams Team logo on the right chest, Puma logo on the left chest & the back of the collar. 85% Polyester / 15% cotton.